A remarkable, enchanting setting for a fascinating historic property. Set amongst the lemon groves of Vendicari Nature Reserve, whose sandy beaches and transparent waters are just a short walk away, Masseria Costanza is a recently restored, magnificently proportioned home where beguiling sea views, an enticing pool, vibrant green lawns, panoramic terraces and sleepy courtyards combine to create a unique environment for an unforgettable holiday. Inside: accommodation at Masseria Costanza is set on the ground floor of this wholly impressive, rambling, historic house (the first floor is unused). The main entrance takes one in to a huge hall, whose lofty, triple-height beamed ceilings set the tone for the rest of the house. Heading left through an arch, a few steps take one down into the equally voluminous living area, where four sink-in sofas are arranged in front of a large arch of sea-view windows and glass doors that lead out onto a panoramic terrace, towards which you will naturally gravitate. Heading back to and crossing the entrance hall, a couple of steps take you up to another large reception room, with comfy seating areas, access to the main internal courtyard on the left and the old olive oil tanks on the right. Up a couple more steps and one is in the splendidly dramatic dining room, the perfect setting for dinners to remember. To the left, up a step, one comes to the large professional kitchen, which will delight even the most demanding of chefs. The kitchen also accesses the main central courtyard where breakfast or lunch might be taken. On the opposite side of the courtyard are the first two double bedrooms. Both are large, bright and comfortably furnished and feature glassed-in en-suite shower rooms. Off another side of the courtyard is the large cinema room, furnished with sofas and armchairs and a projector that beams films onto a large expanse of white wall. This room also contains the original stone olive press wheel, reminding guests that once this house was also the nerve centre of a working farm. Accessed from the cinema room (and also from the main entrance hall) is a small hallway, off which is a double-twin bedroom with en-suite shower room. Steps lead up from the hallway to a super panoramic terrace, looking out to sea. The main courtyard is connected via a corridor to a second, smaller courtyard, off which are four more bedrooms (three doubles and one double-twin) each with its own en-suite shower room. At one end of this second courtyard is a gate providing access to the terrace above the pool. Furnishings throughout are an elegant, pared-back mix of antiques and contemporary pieces that blend subtly with the original fabric and architectural treasures of this unique home. Outside: the number one al fresco spot, where most guests spend most of their time, is the superbly panoramic terrace accessed from the main living area. Comfortably furnished for lounging, sipping on an aperitif and gazing at the hypnotic views which take in the lemon groves and salt pans of Vendicari Nature Reserve and the sea beyond. To one side of this terrace, steps lead down to a large expanse of lawned garden, which leads to a large solarium area and shady al fresco dining area to one side, and the enticing pool area to the other. Back on the terrace, a gate leads to a well-furnished courtyard, from where four of the bedrooms are accessed. The main courtyard, which is accessed from the second reception room, the kitchen and two of the bedrooms, is furnished for sitting or dining and offers a variety of shady areas at different times of the day. Flowering pot plants and a mature banana tree offer a colourful vibrancy to this most Sicilian of settings. Where the gardens end, the lemon groves begin. A path leads through them for about 700m to a gate, which opens onto a country lane. From here it's another 800m to the first sandy beach of Vendicari Nature Reserve. As mentioned in the Area section, in the summer months there is a little trattoria and a bar near the entrance to the reserve, about a 800m away. Both are open during the day, but not in the evening. Masseria Costanza occupies half of a large baglio. The other half, to the rear, is home to an agriturismo, one of whose first floor windows is above Masseria Costanza's main courtyard. 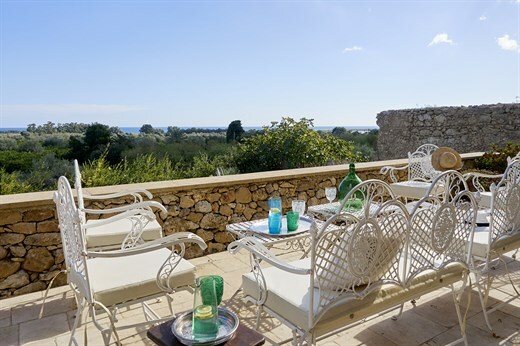 With fifteen hundred hectares of nature reserve on your doorstep, you may not want to move very far, though Masseria Costanza's location is ideal for exploring the southeast of Sicily. The stunning beaches of Vendicari Nature Reserve are about 1.5km away. If you prefer to take the car (please remember that there are no lidos or bars on the beaches, so you should take supplies with you), a few minutes' drive will get you to the car park at the entrance to the reserve. A host of other beaches, many with lidos, are within 30mins drive or less: Eloro, Lido di Noto, Calabernardo, Lido di Avola, Pineta del Gelsomineto and Fontane Bianche heading north, San Lorenzo and Porto Palo di Capo Passero heading south. In the summer months, there is a restaurant within walking distance, about 800m away through the lemon orchards and along the country lane that takes you to the beach. There is also a chic bar just outside the entrance of the reserve, a good place to stop off on your way home for a refreshing aperitif after a hard day on the beach (please note they are not open in the evening). The nearest town, fascinating, gorgeous Noto (15mins drive), is the most easterly of a chain of baroque towns (protected as a UNESCO World Heritage Site), that includes Modica, Ragusa and Scicli. All were rebuilt in flamboyant style following a major earthquake in 1693 and are certainly worth a visit. Heading south from Vendicari, you will soon come to the pretty little fishing village of Marzamemi, which is a great spot for an evening stroll and a sea-front dinner. Quiet and unassuming for most of the year, it comes to life in the summer months with bars and restaurants spilling out onto the lovely square and narrow streets. A stay in this part of Sicily, however, wouldn't be complete without a visit to Syracuse, once the mightiest city in Magna Graecia, and one of Italy's most lovely historic centres. If hiking or horse riding in the hills is your thing, then there is some spectacular scenery in the rushing streams, waterfalls and gorges of Cassibile and Pantalica, a Paleolithic burial site near Syracuse. "Masseria Costancza was AWESOME! It exceeded our expectations and the chef and the house staff were perfect." Masseria Costanza was AWESOME! It exceeded our expectations and the chef and the house staff were perfect. We enjoyed the entire experience of being in a staffed villa. Masseria Costanza was most unusual. Quite wonderful. Masseria Costanza couldn't have been better. We were all very impressed with the villa and the fabulous vistas. Masseria Costanza is an amazing house with many different spaces, beautiful and calm. We had a great family holiday at Masseria Costanza. The team at Masseria Costanza made us feel very welcome, they were beyond helpful, so happy and friendly – they made us feel very much at home. The villa was absolutely beautiful, beyond words really, but it was the group of people working there that made the experience out of this world. We had dinner in the villa on three occasions, all of these evenings were amazing. We can’t thank the staff enough, they made our holiday unforgettable. The whole experience at Masseria Costanza was wonderful and much enjoyed by both my family and the various guests who joined us from Australia, Canada, Holland and France. The conversion of the old buildings has been beautifully done. It was very comfortable with good wi-fi and the TV room and pool were very good and well utilised. The location is perfect for visiting the east coast and the staff were very helpful. I thoroughly recommend your services. Masseria Costanza was very nice. It was overall clean and the fact the each bedroom had its own bathroom was nice. The staff was super friendly and nice. The cook service was excellent value and the food was superb. The Vendicari reserve was unspoilt and simply beautiful. We would best describe our stay at Masseria Costanza as two weeks in paradise. Everything about this villa is exceptional. The property, grounds and surrounding area are truly exceptional. The staff is attentive, friendly and hard-working. They go out of their way to make you feel at home and well-cared for. The beaches were impeccable and breath-takingly picturesque. The location of the villa the top of a hill overlooking a nature reserve guarantees a level of privacy that is difficult to match. All in all, this will be a hard trip to beat in future. We had a wonderful experience. Masseria Costanza was lovely and the staff was wonderful and really made the week special. The property was great. The decoration was amazing and so beautiful. The manager was so helpful and sweet. The two boys working at the villa were also very helpful and nice. The cook was excellent as well. What we most enjoyed about Sicily? Being at the house and having the cook was such a luxury. Everything about this villa exceeded expectations! The villa was stunning and enormous, beautifully furnished and the bedrooms were all beautifully furnished and pretty comparable. The grounds were beautiful, the setting rural and serene and the vistas were spectacular. We cannot say enough about the staff - seamless service always with a smile. We opted for the daily breakfast which was expansive and delicious- definitely worth it. The three dinners we booked were incredible and plentiful. We have many memorable hours spent eating and laughing around the dining room table. We were a group of six couples. The villa is so large and has so many sitting areas and terraces that you never felt crowded. In fact one day, two people stayed behind when we went out sightseeing and they didn't even realize they were in the house together... We opted for a fairly remote location in the Vendicari Reserve in order to experience the Sicily of old away from the larger cities. We were not disappointed. Our holiday exceeded our expectations and we are a very highly traveled group. What did we enjoy most about our holiday? Wonderful historic monuments, astonishing views in the villa and surroundings. The staff were really lovely and the owners were absolutely charming and could not have been more helpful. We spent a wonderful week at this villa, newly restored, where we had the privilege of being the first guests. The owners were very kind, friendly and helpful with great tips. Very attentive staff and always available. Really an unique experience. La masséria est très réussie dans son ensemble et l'intérieur très bien décoré. Nous avons passé un agréable semaine.